Top left: adult, photo by Jenn Burt. Top right: juvenile, photo by Tristan Blaine. Bottom left: photo by Josh Silberg. 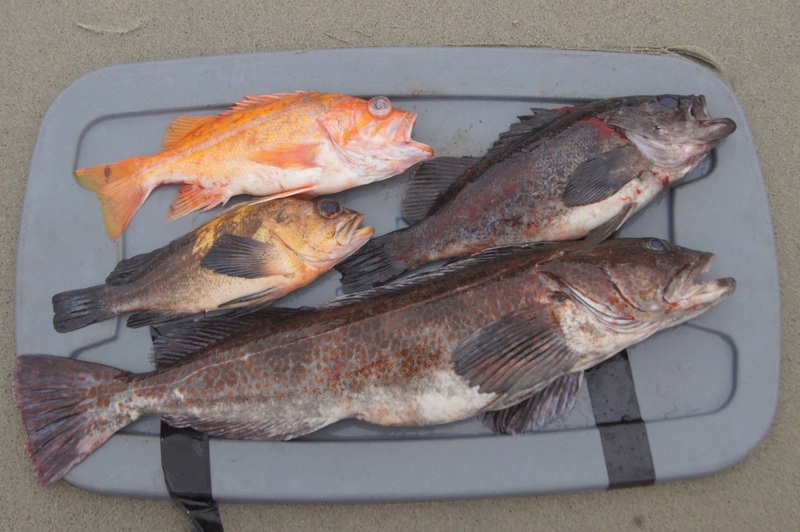 Bottom right: quillback rockfish at middle left, alongside a canary rockfish, a black rockfish, and a lingcod. Photo by Katie Davidson. 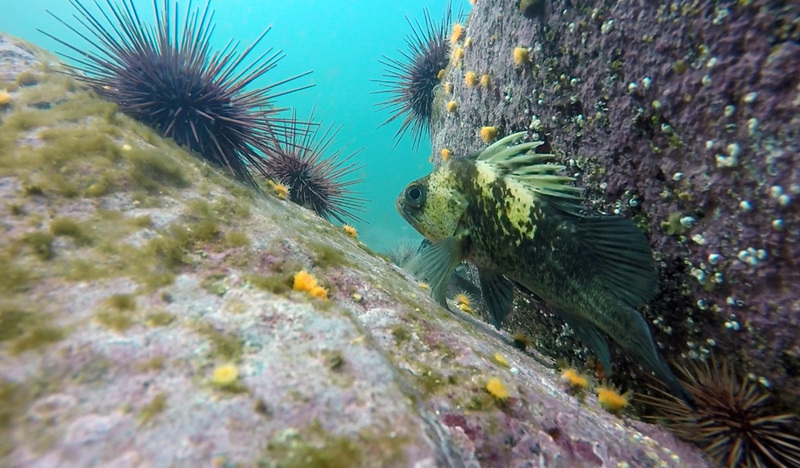 The quillback rockfish is black or dark brown mottled with yellow and orange, and flecked with small brown spots on the lower portion of the head, sides, and breast. It also has a lighter patch on its upper side, near the middle of its dorsal fin. Its dorsal fin is very spiny, hence the common name "quillback." It gets to 60 cm long and 3.3. kg. This species inhabits rocky reefs and bottoms as well as kelp beds, and is always found close to the shelter of sponges and rocks. 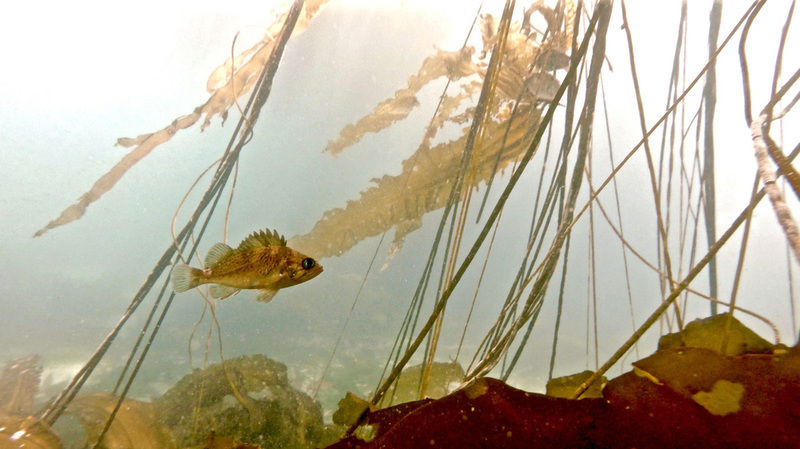 It is a solitary fish, and lives from the intertidal to usually no more than about 90 m deep - however it has been recorded as deep as 274 m. Its range extends from the western Gulf of Alaska to southern California. The quillback rockfish is fished commercially and recreationally, and is sold as fillets or live in fish markets. 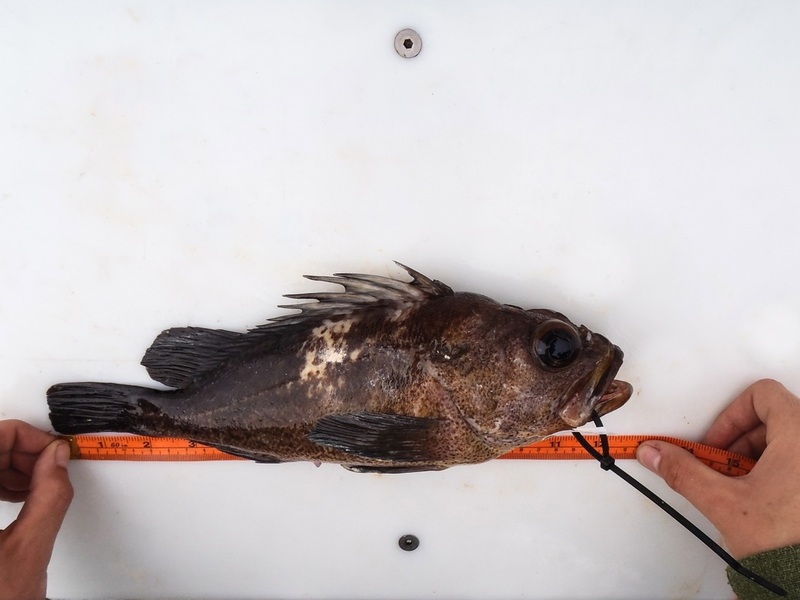 While Harbo states that this species can be common and abundant in areas, it is listed among other rockfish as "not recommended" as a sustainable seafood choice by Ocean Wise. It has also been designated as threatened by COSEWIC (Committee on the Status of Endangered Wildlife in Canada) due to overexploitation of stocks, but is not yet protected under Canada's Species at Risk Act. Read more in the COSEWIC Assessment and Status Report. The oldest recorded quillback rockfish was 90 years old. Froese, R. and Luna, S. M. Sebastes maliger (Jordan & Gilbert, 1880) Quillback rockfish. FishBase. Accessed 10/03/2015. Harbo, R. M. (2011). Whelks to whales: Coastal marine life of the Pacific Northwest [revised]. Madeira Park, BC: Harbour Publishing. P. 216. Lamb, A. and Edgell, P. Coastal Fishes of the Pacific Northwest. Revised. (2010). Madeira Park, BC: Harbour Publishing. Pp. 150-151.